The city of Atlanta, Georgia, was an important rail and commercial center during the American Civil War. Although relatively small in population, the city became a critical point of contention during the Atlanta Campaign in 1864. In the years before the Civil War, Atlanta was a relatively small city, ranking 99th in the United States in size with a population of 9,554 according to the 1860 U.S. Census. However, it was the 12th largest city in what became the Confederate States of America. 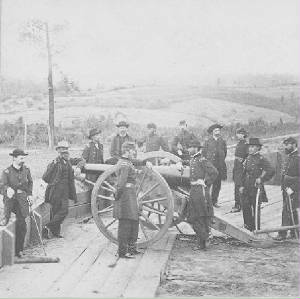 he Atlanta Campaign was a series of battles fought in the Western Theater throughout northwest Georgia and the area around Atlanta, Georgia, during the summer of 1864, leading to the eventual fall of Atlanta and hastening the end of the American Civil War. The Atlanta Campaign followed the Union victory at the Battle of Chattanooga in November 1863; Chattanooga was known as the "Gateway to the South", and its capture opened that gateway. After Ulysses S. Grant was promoted to general-in-chief of the Union Army, he appointed Major General William T. Sherman in charge of the Western armies. Grant's strategy was to apply pressure against the Confederacy in several coordinated offensives. Sherman was ordered to defeat the army of General Joseph E. Johnston, capture Atlanta, and strike through Georgia and the Confederate heartland. Currently, U. S. Grant, George G. Meade, Benjamin Butler, Franz Sigel, George Crook, and William W. Averell, would advance through Virginia against Gen. Robert E. Lee, and Nathaniel Banks would attempt to capture Mobile, Alabama. When the campaign was initiated, Sherman's Military Division of the Mississippi consisted of three armies: Maj. Gen. James B. McPherson's Army of the Tennessee (Sherman's former army that was also commanded by Grant), Maj. Gen. John M. Schofield's Army of the Ohio, and Maj. Gen. George H. Thomas's Army of the Cumberland. When McPherson was killed at the Battle of Atlanta, Maj. Gen. Oliver O. Howard replaced him. Opposing Sherman, the Army of Tennessee was initially commanded by Johnston, who was relieved of his command in mid-campaign and replaced by Lt. Gen. John Bell Hood. At the beginning of the campaign, Sherman outnumbered Johnston 98,500 to 50,000; however, his ranks were initially depleted by many furloughed soldiers, and Johnston received 15,000 reinforcements from Alabama. Moreover, by June, a steady stream of reinforcements brought Sherman's strength to 112,000. Johnston was a conservative general with a reputation for withdrawing his army before serious contact would result; this was certainly his pattern against George B. McClellan in the Peninsula Campaign of 1862. But in Georgia, he faced the much more aggressive Sherman. Johnston's army repeatedly enjoyed strongly entrenched defensive positions in the campaign. Sherman prudently avoided suicidal frontal assaults against most of these positions by “maneuvering in flanking marches” around the defenses as he advanced from Chattanooga towards Atlanta. Whenever Sherman flanked the defensive lines (almost exclusively around Johnston's left flank), Johnston would retreat to another prepared position. Both armies took advantage of the railroads as supply lines, with Johnston shortening his supply lines as he drew closer to Atlanta, and Sherman lengthening (extending or stretching) his own. General William T. Sherman had long considered that the war could not be won without completely breaking the will of the Southern people to continue fighting, and now, he was certain of it. His answer was to take war to the civilians - to pillage, burn, and destroy a large swath through Georgia and the Carolinas, mostly unopposed by any significant enemy resistance. Burke Davis' book, Sherman's March, grippingly tells the story of this dark chapter of American history.